The Water–Energy Simulator (WESim) is an easy-to-use analytical tool that can be used to evaluate the energy and greenhouse gas implications of water management decisions. The Excel-based model allows the user to explore a range of possible scenarios, such as increased demand for water resources, the development of alternative water and energy sources, and needed water treatment improvements resulting from emerging contaminants and stricter water-quality guidelines. WESim can be applied by individual water and energy utilities, groups of utilities, and policymakers and decision makers. A WESim User Manual and report, Implications of Future Water Supply Sources for Energy Demands, are provided, as well. Water provision and use require energy in all phases, from source extraction to the discharge of wastewater. Multiple factors will influence the energy intensity of the water sector in the near future: climate change will affect water supply, quality, and demand, potentially creating a need for new energy-intensive supply and treatment options; population growth, water use patterns, technology, and price all will affect water demand; and emerging contaminants may require more energy-intensive treatment technologies. These trends highlight the need for a clear and consistent methodology for evaluating the energy and greenhouse gas implications of water management decisions. WESim addresses this need, as a tool that creates a common framework in which to explore alternative scenarios. The model is designed to allow you to input actual operating data on water and energy use, allowing for an analysis that better reflects operating conditions. To facilitate use of the model, defaults for the energy requirements of various components of the water and wastewater system are provided, as well. WESim was developed by The Pacific Institute and Dr. Bob Wilkinson, with support from the WateReuse Research Foundation, the California Energy Commission, and the Canadian Mortgage and Housing Corporation. WESim is a Microsoft Excel workbook with a number of macros to facilitate data entry, calculation, and display of results. As you work, the information that you input will be stored in a Microsoft Access database file. The workbook is compatible with Excel 2000 and later versions on PC computers. It has not been tested on Macintosh computers. You must also have Microsoft Access installed on your computer. Download the WESim model (Excel). Download the WESim User Manual. 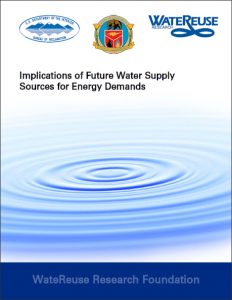 Download the WESim report: Implications of Future Water Supply Sources for Energy Demands.